Recently, I’ve heard from many clients (and fellow birth workers) about a CDC case of recurrent GBS infection in a newborn whose mother chose to encapsulate and consume her placenta. This rightfully has folks concerned about the process of placenta encapsulation, and curious about the safety of placenta encapsulation in the case of testing positive in pregnancy for Group B Strep. Mom tested negative for GBS at 37 weeks of pregnancy, so was not given the recommended antibiotics in labor for GBS. When given in labor, IV antibiotics quickly cross the placenta. The Evidence Based Birth article states that about 9% of women will test negative but actually be positive during labor (meaning they unknowingly expose their babies to this risk without antibiotics, as the mom in the CDC article did). Also, 16% of women who tested positive will actually be negative during labor, meaning they will receive unnecessary antibiotics. Baby was colonized for GBS anyway, needing to spend at least 11 days in the hospital, taking antibiotics. If a baby is born with GBS infection, the hospital should have sent the placenta to pathology to confirm, and then the mother would not have been allowed to release the placenta for encapsulation. This is standard for ANY infection in labor or in the immediate postpartum. I would never process a placenta that was born while an active infection took place in labor, or if a baby had GBS colonization after birth. This is something that all folks who provide placenta encapsulation must check about before moving forward. The doctors came to the conclusion that, because the placenta capsules tested positive for GBS, the mother must have had higher concentrations of the bacteria in her skin or digestive tract, this re-exposing baby to the infection. Group B Strep likes to live in mucous membranes, and there have been a few cases of recurrent GBS that are not-at-all placenta encapsulation related. An adult with an unknown high concentration of GBS could pass it along to a baby with a kiss. The company this mother used states they dehydrate the placenta for encapsulation between 115 and 160 degrees. 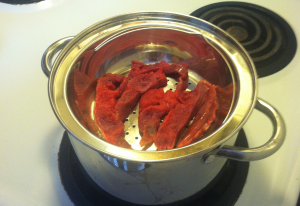 In my practice, I dehydrate a steamed placenta at 145 degrees, and a “raw” placenta at 160 degrees Fahrenheit. The protocol I use is the USDA guidelines for safe meat preservation and dehydration. The article also mentions that a temperature of 130 degrees for 121 minutes is long enough to kill salmonella (implying that other bacteria could be significantly reduced in a similar temperature/amount of time). Whenever I process a placenta, I dehydrate it (keeping it between 145 and 160 degrees) for at least 12 hours. Preliminary research shows that steaming the placenta properly and dehydrating it both have a significant impact on reducing potentially harmful bacteria or pathogens. I always use steamed preparation before dehydrating a placenta if my client tests positive for GBS. This article also says the company in Oregon says storing the placenta capsules at room temperature is ok. I definitely recommend refrigerating the capsules to keep them safe for consumption, because unlike other dehydrated/preserved meat products, the placenta capsules contain no sugar, salt or nitrates to preserve them. Let’s get one more thing straight: GBS is a common bacteria that humans tend to have in their digestive tracts. About 15-30% of folks will test “positive” for a high concentration in the recto/vaginal area during pregnancy. Human bodies are made up of 90% bacteria – 9 out of 10 of our cells are not actually human DNA but bacteria. Folks are just starting to study how bacteria balance in our guts affects health, and how it varies from culture to culture- especially with our current high usage of antibiotics in the US. In the 1970s and 80s, folks realized a large amount of seemingly healthy babies were getting infections after vaginal births (things like pneumonia and other breathing issues – as this baby in the article did suffer), the CDC realized a high concentration of GBS bacteria in the vaginal canal could “colonize” babies on their way out, thus exposing them to the risk of infection. IV antibiotics in labor became the standard of practice, reducing the likelihood of newborns with GBS infections by 80%. There are some folks studying probiotics and rates of GBS, either orally or topically: yes, the preliminary studies show we can positively impact healthy bacteria balance with probiotic pantyliners. Early research implies that Group B Strep is kept in check with lactobacillus bacteria, and even garlic. Other studies imply that GBS likes to live in a yeast-friendly environment, so folks who are prone to yeast infections might be more likely to test positive in pregnancy. Either way- GBS does impact a lot of my clients. Folks who hope to avoid an IV in labor often need to accept IV antibiotics to reduce the risk of passing GBS to a newborn. 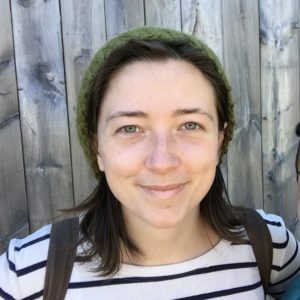 Krystina Fridlander at Baraka Birth has a lovely thorough blog post outlining a lot of the research available on probiotics and Group B Strep. Read more here. 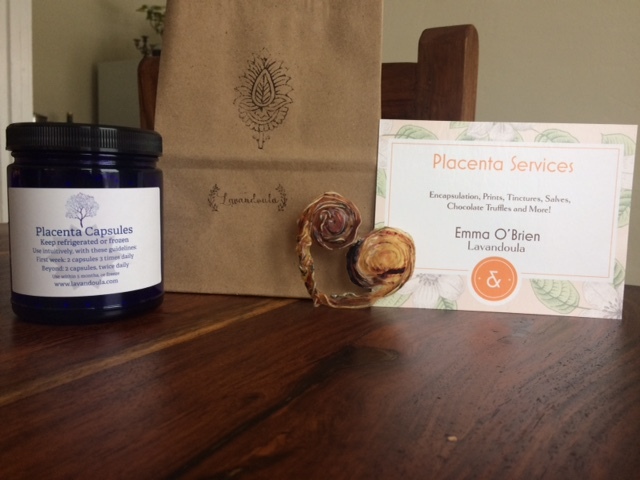 Placenta encapsulation is an unregulated practice in the US. That being said – I am completely transparent about my process with anybody who wants to know. My opinion is: If a client tests positive for GBS, but wants to encapsulate their placenta, they should accept the recommended antibiotics during labor. If you get in two doses before the birth, the chance of passing GBS along to the baby (and also placenta) are significantly lowered. If baby and mom do not exhibit signs of GBS or any other infection during/after delivery, the placenta should be fine to consume. As long as the placenta is handled properly, with sanitized equipment, and dehydrated/preserved using the USDA safe meat handling guidelines, I believe GBS in the placenta will be significantly reduced or eliminated and the capsules will be safe to consume. Here are the answers to some frequently asked questions I receive about placenta encapsulation. Why would anyone want to eat their placenta? I get this a lot. Usually, I start here: all mammals consume the placenta immediately following the birth, with a few exceptions. These exceptions include whales (who have baleen and generally don’t/can’t eat large pieces of meat), and alpaca-family animals (such as camels). When I asked an alpaca farmer at an agricultural fair why they don’t ingest their placentas, she quickly responded “Their tongues aren’t long enough!” Many domesticated/farm animals have humans who interfere with the postpartum process before they instinctively ingest the placenta. The third exception is humans. While there are a few theories as to why this is, many people are now choosing to consume the placenta in capsule form postpartum. In some circles, it isn’t very popular to consume organ meats, but many folks know they’re some of the most nutrient-dense foods in the world. The placenta contains iron, minerals, high-quality protein as well as hormones (oxytocin, progesterone) that sustained the pregnancy and labor. This helps build parents back up after blood loss, especially if it was more than average. Anecdotally, folks who choose to consume their placenta after birth have fewer bouts of hormone-crashing lows, a strong milk supply, and a little more sustained energy throughout all the sleep depravation. How many capsules does it yield? Average is about 80-100 capsules. I’ve processed placentas with as few as 53 capsules (when some pieces were saved for Pathology) and as many as 165 capsules. Generally speaking, I’ve found bigger babies have bigger placentas. How does pickup and drop off work? I’m happy to meet you at your place of birth between 8am and 9pm to pick up your placenta. With some advance notice that you’re in labor (either from you or a partner or doula), I may be able to arrive for pickup quicker. As long as the placenta is kept on ice within two hours after the birth, we should be all set for processing. Processing takes 2-3 days, on my end, and I am happy to return the finished capsules to you when you return home from the hospital. What if I have medications during labor, or need a cesarian section? That is fine! The medications used during labor generally pass through the placenta or break down quickly. If you had an allergic reaction to any medication given during labor, I would not recommend encapsulation. With a cesarian birth, it is extra important to make sure the placenta is put on ice soon afterward, because everyone tends to be a little busier during that time than with a vaginal birth! What if I am Group B Strep positive? Group B Strep (GBS) is a normal digestional bacteria that some folks have a high concentration of in the genital area during pregnancy and birth. It is not considered harmful to adult humans (just in rare cases for babies), and I generally recommend steaming the placenta before dehydration for folks who are GBS+. What if there was meconium in labor? Meconium happens! It is sterile and not harmful to adults. Extra nurses will be present at your birth to check out the baby’s lungs and make sure your baby did not aspirate the sticky meconium. Otherwise, meconium washes off the placenta easily during processing and does not contraindicate placenta encapsulation. If there is prolonged exposure to thick meconium, the placenta may look “stained” upon delivery and providers may want to send it to pathology to have it looked at, but that is much less common. What if my baby is premature? With premature birth, many hospitals will want to send the placenta to pathology to make sure that it wasn’t the cause of a premature birth. In this case, you can advocate for the placenta being kept refrigerated, frozen and chemical-free. The pathologist should be able to remove a few small pieces from the placenta and leave the rest for you to take home, if no problems are found. Keep in mind that hospital pathologists work M-F, 9-5, so this can delay the process, depending on the time you give birth. With any placenta that has been to pathology (even if it is kept separate), I recommend steamed preparation. How does my birth site impact my decision to keep my placenta for encapsulation? Great question! I always recommend folks talk with their providers about keeping the placenta ahead of time, just to make sure there are no issues. Every birth site (except for homes) will require you sign a placenta release form after the birth before it is able to leave. Certain hospitals have policies that may further impact your experience. For example, Brigham and Women’s Hospital’s policy is to keep the placenta in the hospital until the family and baby are released. They keep it refrigerated for you, but this will delay my ability to process by a few days. Beth Israel Hospital does not let anyone bring the placenta into the postpartum room with them. This means, if you’re hoping to keep your placenta and you’ve given birth in the middle of the night, you need to keep it in a cooler in your car (or have another family member pick it up and bring it to a refrigerator) until I am able to pick it up. Cambridge Birth Center generally releases patients within 6-8 hours after the birth. If you give birth at the birth center, and it is late at night, I may be able to pick up the placenta in the morning from your home. If you have particular questions about the placenta-related policies at your birth site, be sure to ask your provider. What about payment? My fee for placenta encapsulation is $250. Cash or check are welcome. The fee is due at the time I deliver the finished capsules. In the off chance that you are unable to keep the placenta, I do not require a downpayment. This past week, I was excited to host my friend Anabel, of La Loba Loca, who was in town to facilitate some skillshares at local colleges. Seriously- if you’ve got folks who are interested in sexual health, herbalism, and community-based care, bring her to your community! We met last year at CLPP and, together with others, organized a workshop in Los Angeles this summer. We realized we were born less than two weeks apart, both cling to yarrow as we meet (and love to meet) TONS of people in our work, shared our 1970’s feminist/herbalist/queer book collections and spun wool together. I also took her to my favorite part of Boston, the Forest Hills Cemetery. We walked around the small chunk of local wilderness behind the gravesite and talked about how we best like to dry out an umbilical cord when preparing the placenta for encapsulation. She knew someone who would tincture the cord, separately, and suggests using it when a birth parent needs to be away from their child. Connection medicine. 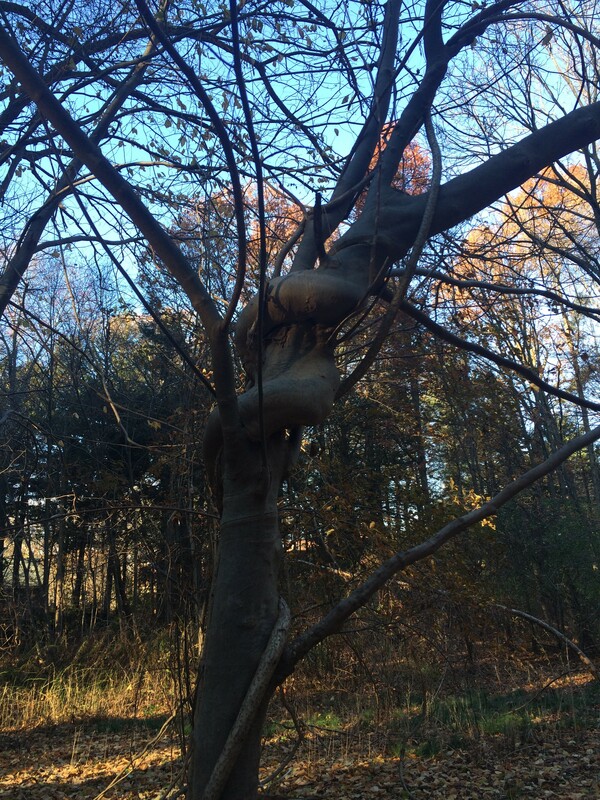 Loba and I found this tree and stopped to check it out for a moment. Parents in the Boston area should be made aware of Mama and Me, a space that holds events and classes for young families in Jamaica Plain. They offer a range of prenatal, postpartum and child development classes, including some free events! Upcoming on Wednesday, April 8 from 6-8pm will be their next FREE Doula Information Night. I will be present (if no babies come that night) to meet with expecting parents and chat about my services as a birth and postpartum doula, including placenta encapsulation. Come out and meet the doulas in your community! In the West, placenta encapsulation is usually performed one of two ways. Either the placenta is sliced and dehydrated raw before grinding into a powder or done the “TCM” way. TCM stands for Traditional Chinese Medicine, and when used to describe placenta preparation, this often means your doula will steam the placenta with lemon, fresh ginger and spicy peppers. 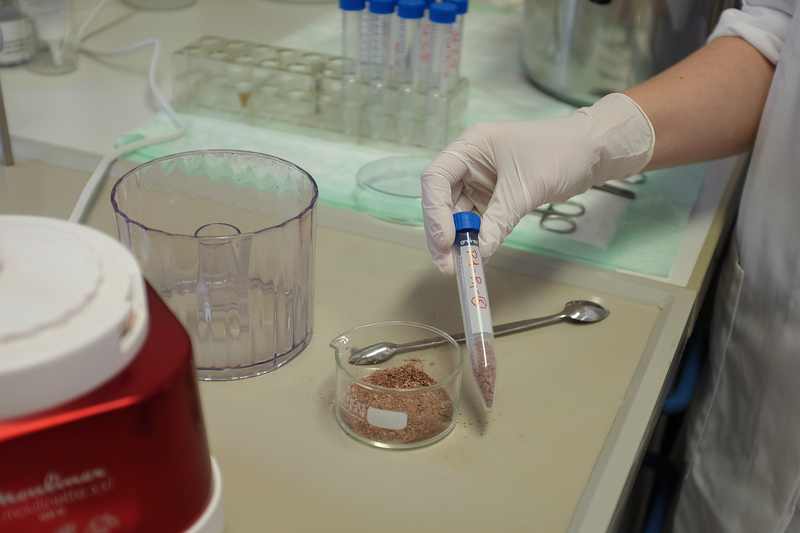 The remainder of the process stays the same: powdered placenta is stuffed into capsules for the ingestion of the postpartum mother. Parents frequently ask if I recommend one method of preparation over another. While I do prepare placentas for folks who prefer raw, I tend to stick with the encouragement of cooked foods and warm herbs postpartum. Steaming the placenta is thought to bring warmth postpartum. As Jasper Moon at Turning Tides Midwifery blogs, “Traditional Chinese Medicine” preparation of a placenta is anything but traditional. The common recipe for preparing placenta the “TCM way” involves using warming elements, such as lemon, ginger, and hot peppers while steaming the placenta. This recipe was popularized by the Midwives Alliance North America conference in 1984, when Raven Lang presented it. Lang is a self-taught direct-entry midwife from California, pioneer in the midwifery movement in the United States and Traditional Chinese Medicine practitioner. In TCM, postpartum is considered a very yin or cold time, and steaming the placenta before ingestion with warming herbs fits within that idea to facilitate warmth. This is what qualifies steamed placenta preparation as “traditional.” Jalapeños and lemons are very commonly accessible to midwives and doulas in the West, but I can’t think of an herbalist who considers lemons warming. The placenta has been considered medicinal for purposes in Chinese materia medica, but encapsulation postpartum goes back about thirty years in the U.S. I wonder why, with few “strict” historical interpretations of placenta preparation postpartum, so many encapsulation specialists stick with the same herbs for steaming. As an herbalist, using “nontraditional” herbs for “Traditional Chinese Medicine” placenta preparation is interesting to me. With knowledge of our particular client’s concerns, we can be empowered to make more educated choices about our use of herbs. This June, I prepared chocolate placenta truffles for a first time mom. While raw honey, coconut oil, and dried cherries appealed to mom, I chose to steam her placenta with cloves, cinnamon, nutmeg and ginger. These are all herbs that are considered warming, gently stimulating and are pleasantly fragrant to work with.